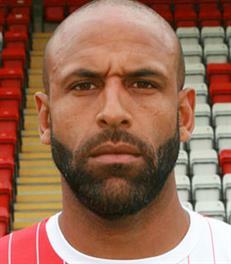 The former Stoke City, Burnley and Southampton defender Wayne Thomas signed for the Harriers in June 2016 becoming new manager, John Eustace’s first signing. He has recently left Worcester City after two seasons with them and at the age of thirty seven we could well be the last club he plays for. He started his career with Torquay Utd before joining Stoke and the other top clubs but then opted to go to Greece to play for Atromitos and Veroia before returning back to England to join then non league Luton Town but didn’t last long there before joining up with Tamworth. He came here on a one year contract but rarely featured and then finally left one season later. Within a few weeks he was appointed as the new manager of Rushall Olympic.